If your furnace or heat pump is on the fritz, Delta Plumbing, Heating & Cooling is here to help. Our professionally trained technicians and fully-stocked service vehicles are only minutes away. 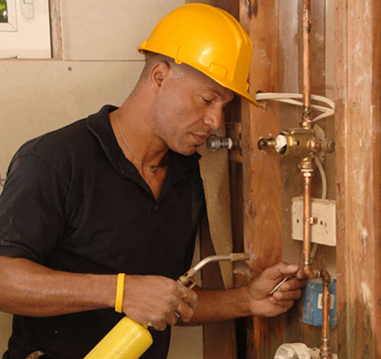 Call us 7 days a week for emergency service or same-day heating repair. Our technicians have the skills and expertise to fix any type of heating problem and get you back in your comfort zone. Strange noises in any kind of heating system are almost always a cause for concern, whereas a yellow furnace flame or unexplained flu-like symptoms can signal a carbon monoxide leak. If your furnace or heat pump is nearing the end of its lifespan, you might want to consider replacement sooner rather than later. It’s easier and cheaper to replace a furnace during the warmer months than waiting until it breaks down in the middle of January. Replacing your existing furnace or heat pump can save you money over time. A new heater with a programmable thermostat, or a zoned system that allows you to heat only the rooms you use can significantly reduce monthly energy costs. After saving with Delta PHC, every month will bring you high efficiency when it comes to the functionality of your new furnace or heat pump - a new heater can eventually pay for itself! Whether your heater is new, or has had many years of use, it should be inspected and maintained annually, preferably before the cold weather kicks in. Annual service will save money on repair bills, minimize breakdowns and ensure that your heating system is operating safely. A well-maintained heating system will function more efficiently, consume less energy, cost less to operate and have a longer lifespan. We're available 24 hours a day 7 days a weeks and we offer a FREE estimate on all services. Call Delta Plumbing, Heating & Cooling today at (845) 553.3057 for quality Hudson Valley heating service and solutions! Whether you’re looking to install, repair or service a room air conditioner or central air, Delta is the ideal choice. We rate customer satisfaction as a top priority and work to build relationships in the Hudson Valley by exceeding expectations. Call Delta Plumbing, Heating & Cooling for all your heating and cooling needs.